Base of Headboard Panel to Floor: 22.938"
Box Spring Required: If the Base of the Headboard Panel to Floor Measurement minus the Top Height of Mattress Supports Measurement is less than the height of your mattress we recommend a box spring. Customize this classic panel bed or headboard to create a beautiful bedroom focal point. With a wood insert panel, your bed shows off the beautiful grain of solid red and white oak. Or choose a fabric or leather insert, with hundreds of options in fabric and color, to add a little contrast. Select nail head trim options available in store. Beds are available in queen, king, and California king. 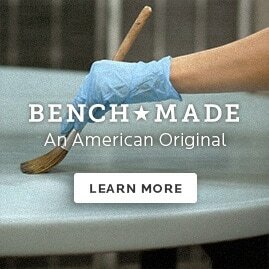 Our Bench*Made Oak collection offers purely American, heirloom-quality furniture. Bench made refers to furniture built with a high level of attention and detail, with each piece individually created from a craftsman's bench. It's a standard of quality that we uphold for our Bench*Made Oak collection. We harvest oak from Appalachian region in the eastern United States, careful to select pieces with high degrees of natural characteristics and beauty. Our artisans then use those quality pieces of oak to create each piece?made to order?in Bassett, Virginia. Whether you need a coffee table, dining chair, panel bed, or more, our collection offers quality oak furniture that you'll enjoy for years to come.